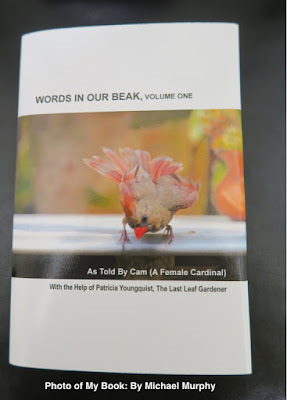 If you have read my blog post for yesterday and the one for the day before that, then you may know a hard-cover version of the book I wrote with Cam, Words In Our Beak Volume One (WIOB_V1) will soon be available in bookstores, speciality shops, and on line. An image of this book's cover can be seen atop this entry. The photo was taken by Michael Murphy. I've kind of gone backwards in this process of helping Cam (the "covergirl" on the book) write and publish her book. I say this because WIOB V1 started as a digital book in Apple's iTunes Store. 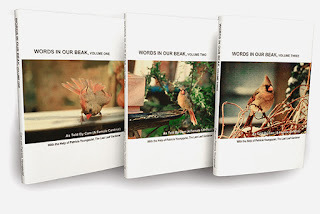 However, because there are over three hundred pictures in the book (taken by me), I was advised to convert it into a non-digital book, which I have done, and it has been available as a soft-cover book on MagCloud since this past March. Now, bookstores and speciality shops have expressed interest in carrying my book, but these places of business want to work with a publisher who offers distribution services, which MagCloud does not have at this point. That's why I have created the hard-cover format that's seen in the image above. The book has been published through Lighting Source, a division of Ingram Spark. Last evening I had a meeting with Chris Deatherage, who formatted the soft and hard cover versions. We still have to work out a few details involving price points which I will hopefully be able to do today, or tomorrow as doing so, would enable me to have book available for distribution late next week. Moreover, tomorrow is the first Saturday of the month in the month of November, which means it's one of the holidays for National Book Lover's Day. It would be great for Cam and I to celebrate it by completing these pricing issues and making the book available for distribution. Meanwhile, I'm saying that I've kind of gone backwards, because normally authors start out with a hard-cover book, then subsequently publish soft-cover and/or digital versions. But who knew I'd take this route. In any event, Cam and I have finished volume two, but it needs to be formatted (by Deatherage, who has our files) and this time she and I will have that volume begin as a hard cover.